James Wang, test conductor for Curiosity, with the model of the rover used for experiments on Earth. NASA's rover Curiosity successfully carried out a highly challenging landing on Mars early Monday, transmitting images back to Earth after traveling hundreds of millions of miles through space to explore the red planet. Scientists praised the landing Monday. "This is a stunning achievement. 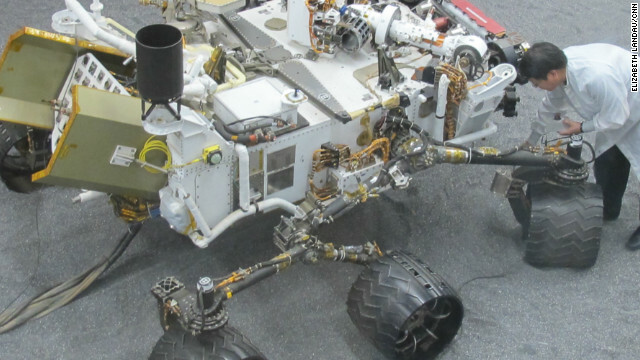 The engineering went flawlessly," said Scott Hubbard, who was the first Mars program director at NASA headquarters, and is currently a consulting professor at Stanford University. The 10 science instruments aboard Curiosity are in "perfect health," and testing and calibration are under way, NASA said Monday.